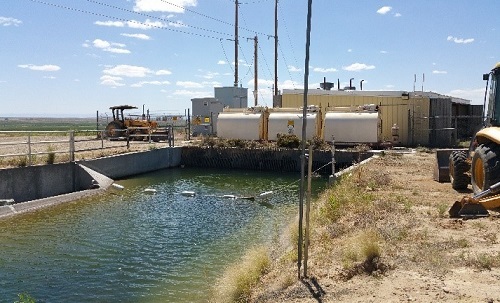 NAPI Web-Based Water Management System (NM) | WEST Consultants, Inc.
WEST assisted Keller Bliesner Engineers with the development of their Web-based water management system for Navajo Agricultural Products Industries (NAPI). NAPI operates the Navajo Indian Irrigation Project, which consists of more than 70,000 acres with more than 600 center pivots. Water is pumped from canals to run the center pivots. On the web, farmers enter times when they intend to operate their center pivots. The KBE part of the software accumulated these demand to canal outlets (>60); pumping stations, and gravity outlets. WEST developed a program for canal management that was part of this water management program. The WEST program considers each hourly change in demand as a water order. These water orders are routed upstream to the main canal inflow point at Cutter Dam and are accumulated at each check gate. The program determines the flow rate required at each check gate during 6-hour time horizons. The flow is adjusted at each gate at a time that provides the needed volume downstream. The program provides a schedule of flow changes and gate adjustments for each gate for each 6-hour period. Development of the program required an understanding of how volumes change as a function of flow rate and downstream depth. A HEC-RAS model of the canal was developed to model these properties of the canal. The model was calibrated by collecting water depths and gate positions during a steady-flow period. The calibration effort uncovered several issues where the canal could not meet design capacity. It also improved gate calibrations. The project has two lift stations that lift water to higher elevation canals. The canal scheduling software also provides recommendations on when to turn pumps on and off within the lift stations. The operator can interactively change the schedule of pump changes at the lift stations. The canal scheduling program also schedules the flow changes to satisfy lift station demand changes.